Yakitori chicken is perfect bento food – short skewers of chicken and baby leeks drizzled with a sweet savoury sauce. You can cook your chicken on an ordinary bamboo skewer, then when cool, rethread onto another, fancier skewer – try using a hors d’oeuvre pick for a really fancy look. To make this bento, you also need to make a devilled egg. Simply hard boil an egg, then slice in half and remove the yolks. Mix the yolks with ¼ tsp of your favourite Indian curry powder, 2 tsp mayonnaise and some chopped parsley. Then, return the filling to the gap where the yolk was, and top with more parsley. You also need to cut out some shapes from thinly sliced carrot. As well as this, you’ll need lettuce, curly parsley, cherry tomatoes, cooked Japanese rice and furikake. 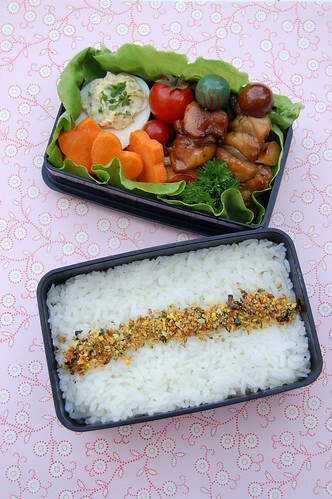 Fill the bottom layer of your bento with the rice, then add a line of furikake. Line your top layer with lettuce, and nestle your rethreaded yakitori chicken to one side. On the other side, place your devilled egg, then fill any gaps with the carrot shapes, parsley and tomatoes. Firstly, make the sauce by simmering the ingredients in a saucepan. This could take as long as 20 minutes, but make sure it doesn’t overcook and burn. You want the sauce to be thick enough to cling to the chicken when it grills. Cut the chicken into small cubes and cut the spring onion or leek into similarly sized lengths. Skewer the chicken and leek alternately onto your soaked bamboo skewers. Put your chicken skewers under the grill and allow the chicken to go white on both sides. Now brush on your thick yakitori sauce and continue to grill until the chicken is brown and glossy, basting as you go along. Once the chicken is a rich, glossy brown, it should be cooked in the middle and ready to serve. Sprinkle with Japanese seven spice powder. Don’t squash the chicken up against other pieces of chicken – you want a little space to ensure all the meat is cooked through. The leek in between each piece of chicken will help to separate out the meat and ensure the finished dish looks colourful. This recipe originally appeared in 501 Bento Box Lunches, published by Graffito Books.